Blue Scholars and Common Market Win Seattle Weekly Awards — Paolo M. Mottola Jr.
Congratulations to Blue Scholars and Common Market for their Seattle Weekly Music Awards victories. 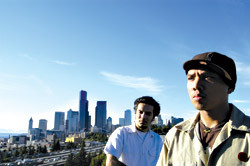 Blue Scholars won Best Hip-Hop Group and Top Vote Getters Overall. Geologic also took the Best Vocalist award. Common Market took the Best New Artist award (against some tough non-hip-hop competition). By the way, I finally picked up my Blue Scholars sweatshirt yesterday. Support quality local music!